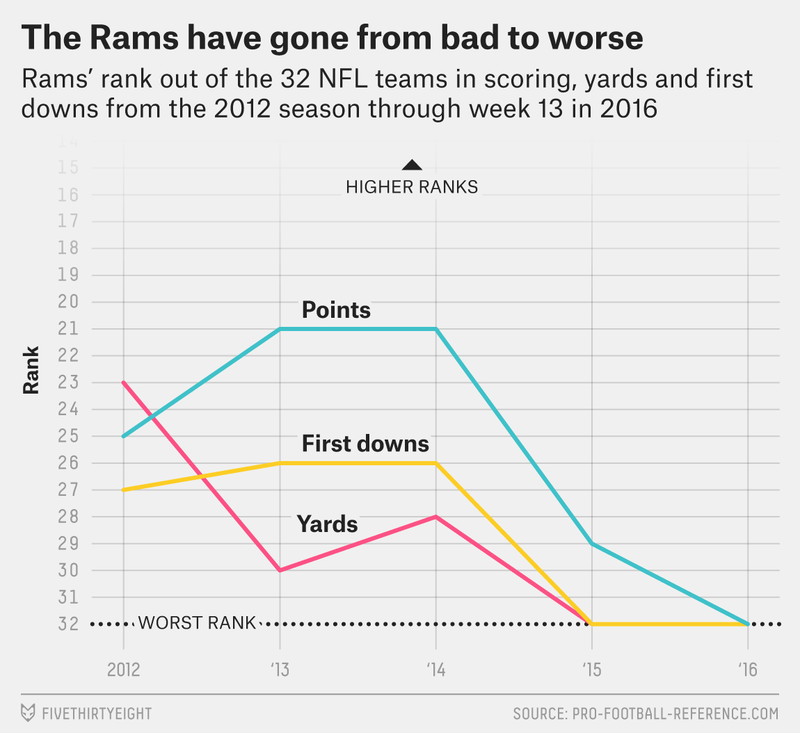 This was supposed to be a big year for the Rams. It began with the relocation of the franchise from St. Louis back to Los Angeles. Then, the team spent an enormous amount of draft capital to move to the top of the draft to select quarterback Jared Goff. The team was featured on HBO’s “Hard Knocks” where head coach Jeff Fisher renounced the idea of going 7-9 (explicit). Now? The 4-8 Rams would be lucky to finish with that record. When Fisher arrived in 2012, the team was awful. It had won just one game in 2009 and two in 2011; in other words, Fisher inherited a team devoid of talent. But the 2012 RG3 trade allowed the Rams to restock the roster, and four years of drafting was supposed to set the Rams up for long-term success. And through the opening four weeks this season, it looked like the Rams’ investments were finally realizing a return. Los Angeles was 3-1, including wins over division heavies Seattle and Arizona. The Rams were to be taken seriously, we were told. Since then, L.A. has gone 1-7, with the lone victory coming in a 9-6 snoozer against a bad Jets team featuring quarterback Bryce Petty in his first NFL start. And if there’s a theme to the Rams’ unyielding mediocrity under Fisher, it’s a bad offense that seems to get worse the more resources it’s given. L.A. ranks last in scoring, yards and first downs, and in the case of the latter two categories, for the second year in a row. The issue for the Rams offense is, well, everything. Fisher and general manager Les Snead arrived together in 2012, and have failed to scratch together anything resembling a functioning offense. Fisher and Snead inherited Sam Bradford, who had just finished his second year as a pro, and brought in offensive coordinator Brian Schottenheimer and quarterbacks coach Frank Cignetti to groom him. Bradford never panned out in St. Louis, Schottenheimer and the Rams parted ways after three disappointing years; Fisher then promoted Cignetti to offensive coordinator before firing him after 12 games. The team’s current offensive coordinator, Rob Boras, is Fisher’s third with the franchise, but there have been no signs of improvement. The Rams moved on from Bradford by trading him for Nick Foles in 2015; in his lone season with the team, Foles posted the lowest QBR in the NFL. This year, Los Angeles handed the starting job to veteran Case Keenum despite paying a king’s ransom to obtain Goff. The results? Keenum has the lowest QBR in the league, and was finally benched for Goff three weeks ago. It’s premature to make any long-term predictions about Goff’s career, but he currently has a lower QBR than Keenum, and has worse statistics than the cellar-dwelling Keenum in nearly every major category (completion percentage, yards per attempt, sack rate, yards per completion, yards per game). Fisher and his staff have worked with two No. 1 overall picks at quarterback, and a number of veterans, and the Rams have yet to make any noticeable progress at the game’s most important position in his five-year tenure. The results have been mixed at best. Pead finished his Rams career with just 27 carries, while Mason rushed for 972 yards over two seasons with the team before his career was halted due, in part, to mental health issues. Gurley was a bright spot for the team last year but has been one of the bigger disappointments on one of the league’s most disappointing teams this season. In his last 16 full games — i.e., a full season’s worth of work — he has rushed 276 times for only 991 yards, a 3.59 yards per carry average. While Gurley remains a talented player that the Rams could presumably build around, it’s tough to determine just how good he is when he’s got nowhere to run. The Rams hit the wide receiver position early and often in the early years of the Fisher/Snead regime, with four top-100 selections used in the first two years. Three were outright busts: Brian Quick (33rd overall in 2012), Stedman Bailey (3rd round, 2013), and Chris Givens (4th round, 2012) all failed to make significant impacts. The fourth, Tavon Austin, has been more productive, yet both his failures and successes come off as indictments of the Fisher Rams. St. Louis paid a significant price to trade up to select the diminutive Austin with the eighth pick in the 2013 draft; on a good team, Austin’s blend of rushing and receiving ability — he is the only wide receiver with at least 800 rushing and 800 receiving yards since 2013 — would make him like a Swiss army knife of offensive weapons, able to punish teams in multiple ways. Instead, the Rams have never quite figured out how to integrate Austin effectively and consistently into the offense: He has never hit 500 receiving yards, 500 rushing yards or 1,000 total yards from scrimmage in a single season. The Rams spent the second overall pick on Greg Robinson in 2014; and while he has started 39 games in his career, he has never come close to living up to the hype. Two games ago, he was a healthy scratch before a game against New Orleans. Jamon Brown, a third-round pick last year, has had two injury-plagued seasons with the team. Rob Havenstein, a second-round selection at tackle last year, has been passable, which is more than we would say about the other linemen drafted by the Rams. Los Angeles ranks 31st in yards per carry and has the sixth-worst sack rate, two statistics primarily used to judge offensive lines. The team has the worst drive success rate in the NFL, which speaks to the entire offense’s inability to string together successful offensive plays. Much of the blame for that falls on the offensive line, which has struggled while playing with numerous quarterbacks, running backs and receivers. Ultimately, the team’s failures over the last five years fall on Fisher. The veteran head coach may have inherited a bad team, but the Rams rank 26th in winning percentage since he arrived. No team had more draft capital 2 from 2012 to 2014 than the Rams. Those drafts could have rebuilt the roster, and they formed the core for a 2016 team that could contend for a Super Bowl. The last time one of Jeff Fisher’s teams had a winning record was in 2008. If the Rams lose another game, he will become just the fifth coach in history with five consecutive losing seasons with the same team. The last was David Shula with the Bengals, who was fired midway through his fifth season in 1996. The one before him was Lou Saban, who resigned midway through his fifth-straight losing season in 1971. A third was Bill McPeak with Washington in the 1960s, who did not see a sixth season, either. The last was Tom Landry, who was the first coach for the expansion Cowboys, in a very different era of pro football. Yet despite the string of failures, the Rams appear content to have Fisher return in 2017. And while Fisher is respected in NFL circles, it’s fair to say that no modern coach has been given as long a leash, and delivered such short results, as Fisher has with the Rams. Using the draft value chart I created at FootballPerspective.com. Based on the Football Perspective chart. Note that this excludes supplemental draft picks, although the only supplemental draft pick used was a second-round choice by Cleveland on Josh Gordon.